The hypothalamic–pituitary–thyroid axis (HPT axis for short, aka thyroid homeostasis or thyrotropic feedback control) is part of the neuroendocrine system responsible for the regulation of metabolism. 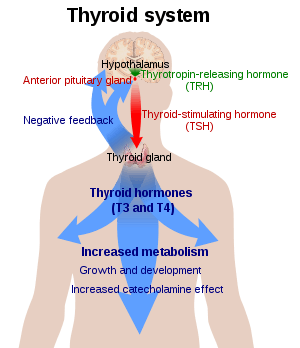 The hypothalamus senses low circulating levels of thyroid hormone (Triiodothyronine (T3) and Thyroxine (T4)) and responds by releasing thyrotropin-releasing hormone (TRH). The TRH stimulates the pituitary to produce thyroid-stimulating hormone (TSH). The TSH, in turn, stimulates the thyroid to produce thyroid hormone until levels in the blood return to normal. Thyroid hormone exerts negative feedback control over the hypothalamus as well as anterior pituitary, thus controlling the release of both TRH from hypothalamus and TSH from anterior pituitary gland. Convergence of multiple afferent signals in the control of TSH release may be the reason for the observation that the relation between free T4 concentration and TSH levels deviates from a pure loglinear relation that has previously been proposed. Low-T3 syndrome and high-T3 syndrome: Consequences of hypodeiodination or hyperdeiodination, e.g. in critical illness. Thyroid hormone resistance: Feedback loop interrupted on the level of pituitary thyroid hormone receptors. ↑ References used in overview figure are found in image article in Commons: References. ↑ References used in detailed figure are found in image article in Commons: References. ↑ Lechan, Ronald M.; Fekete, C (2004). "Feedback regulation of thyrotropin-releasing hormone (TRH): mechanisms for the non-thyroidal illness syndrome". Journal of endocrinological investigation. 27 (6 Suppl): 105–19. PMID 15481810. ↑ Prummel MF, Brokken LJ, Wiersinga WM (2004). "Ultra short-loop feedback control of thyrotropin secretion". Thyroid. 14 (10): 825–9. doi:10.1089/thy.2004.14.825. PMID 15588378. ↑ Hoermann R, Midgley JE, Giacobino A, Eckl WA, Wahl HG, Dietrich JW, Larisch R (2014). "Homeostatic equilibria between free thyroid hormones and pituitary thyrotropin are modulated by various influences including age, body mass index and treatment". Clin Endocrinol (Oxf). 81 (6): 907–15. doi:10.1111/cen.12527. PMID 24953754. ↑ Dietrich, JW; Midgley, JE; Larisch, R; Hoermann, R (December 2015). "Of rats and men: thyroid homeostasis in rodents and human beings.". The Lancet. Diabetes & Endocrinology. 3 (12): 932–933. doi:10.1016/S2213-8587(15)00421-0. PMID 26590684. ↑ Hoermann, R; Midgley, JE; Larisch, R; Dietrich, JW (2015). "Homeostatic Control of the Thyroid-Pituitary Axis: Perspectives for Diagnosis and Treatment.". Frontiers in Endocrinology. 6: 177. doi:10.3389/fendo.2015.00177. PMID 26635726. ↑ Hoermann R, Midgley JE, Larisch R, Dietrich JW (2015). "Integration of Peripheral and Glandular Regulation of Triiodothyronine Production by Thyrotropin in Untreated and Thyroxine-Treated Subjects". Hormone and Metabolic Research. 47: 674–80. doi:10.1055/s-0034-1398616. PMID 25750078. ↑ Brokken LJ, Wiersinga WM, Prummel MF (2003). "Thyrotropin receptor autoantibodies are associated with continued thyrotropin suppression in treated euthyroid Graves' disease patients". Journal of Clinical Endocrinology & Metabolism. 88 (9): 4135–4138. doi:10.1210/jc.2003-030430. PMID 12970276. ↑ Hoermann R, Eckl W, Hoermann C, Larisch R (2010). "Complex relationship between free thyroxine and TSH in the regulation of thyroid function". European Journal of Endocrinology. Bioscientifica. 162 (6): 1123–9. doi:10.1530/EJE-10-0106. PMID 20299491. ↑ Clark PM, Holder RL, Haque SM, Hobbs FD, Roberts LM, Franklyn JA (2012). "The relationship between serum TSH and free T4 in older people". Journal of Clinical Pathology. 65 (5): 463–5. doi:10.1136/jclinpath-2011-200433. PMID 22287691. ↑ Hoermann R, Midgley JE, Larisch R, Dietrich JW (2012). "Is pituitary TSH an adequate measure of thyroid hormone-controlled homoeostasis during thyroxine treatment?". European Journal of Endocrinology. Bioscientifica. 168 (2): 271–80. doi:10.1530/EJE-12-0819. PMID 23184912. ↑ Midgley JE, Hoermann R, Larisch R, Dietrich JW (2013). "Physiological states and functional relation between thyrotropin and free thyroxine in thyroid health and disease: In vivo and in silico data suggest a hierarchical model". Journal of Clinical Pathology. 66 (4): 335–42. doi:10.1136/jclinpath-2012-201213. PMID 23423518. ↑ Reichlin S, Utiger RD (1967). "Regulation of the pituitary-thyroid axis in man: Relationship of TSH concentration to concentration of free and total thyroxine in plasma". The Journal of Clinical Endocrinology and Metabolism. 27 (2): 251–5. doi:10.1210/jcem-27-2-251. PMID 4163614. ↑ Liu S, Ren J, Zhao Y, Han G, Hong Z, Yan D, Chen J, Gu G, Wang G, Wang X, Fan C, Li J (2013). "Nonthyroidal illness syndrome: Is it far away from Crohn's disease?". Journal of Clinical Gastroenterology. 47 (2): 153–9. doi:10.1097/MCG.0b013e318254ea8a. PMID 22874844. 1 2 Dietrich, J. W. (2002). Der Hypophysen-Schilddrüsen-Regelkreis. Berlin, Germany: Logos-Verlag Berlin. ISBN 978-3-89722-850-4. OCLC 50451543. 3897228505. ↑ Jostel A, Ryder WD, Shalet SM (2009). "The use of thyroid function tests in the diagnosis of hypopituitarism: Definition and evaluation of the TSH Index". Clinical endocrinology. 71 (4): 529–34. doi:10.1111/j.1365-2265.2009.03534.x. PMID 19226261. J. W. Dietrich, A. Tesche, C. R. Pickardt, U. Mitzdorf: "Thyrotropic Feedback Control: Evidence for an Additional Ultrashort Feedback Loop from Fractal Analysis", in: Cybernetics and Systems, 2004, 35 (4), S. 315–331; doi:10.1080/01969720490443354. C. Gauna, G. H. van den Berghe, A. J. van der Lely: "Pituitary Function During Severe and Life-threatening Illnesses", in: Pituitary, 2005, 8 (3–4), S. 213–217; doi:10.1007/s11102-006-6043-3.